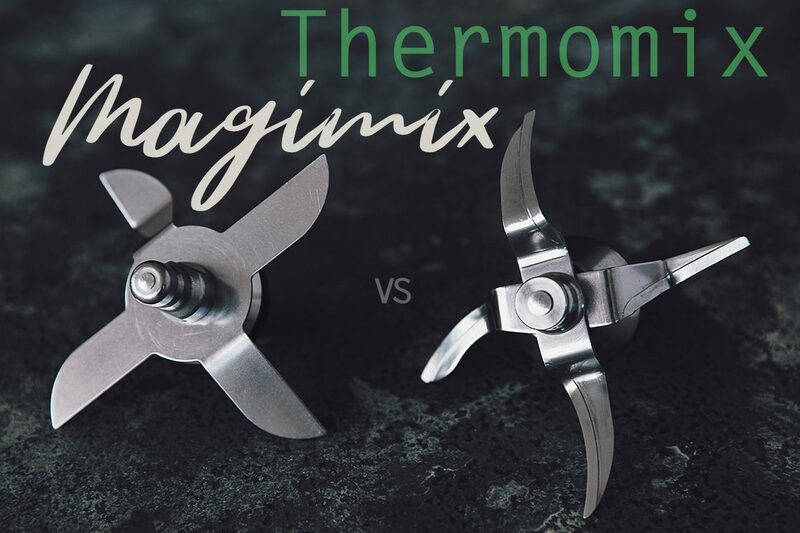 This is the ultimate battle: Magimix Cook Expert vs Thermomix. Get yourself a nice drink, it’s going to be long…. When I decided to buy a thermo-appliance one year and a half ago I started by creating this complicated comparison table on an Excel spread sheet where I put down all the machines I potentially wanted to buy, and noted all their interesting characteristics one by one. I attended many demos and read lots of webpages and cool advertising leaflets. Then I thought that all my painful research work was worth sharing so I created a more readable table HERE which started fascinating discussions between my lovely readers and I. 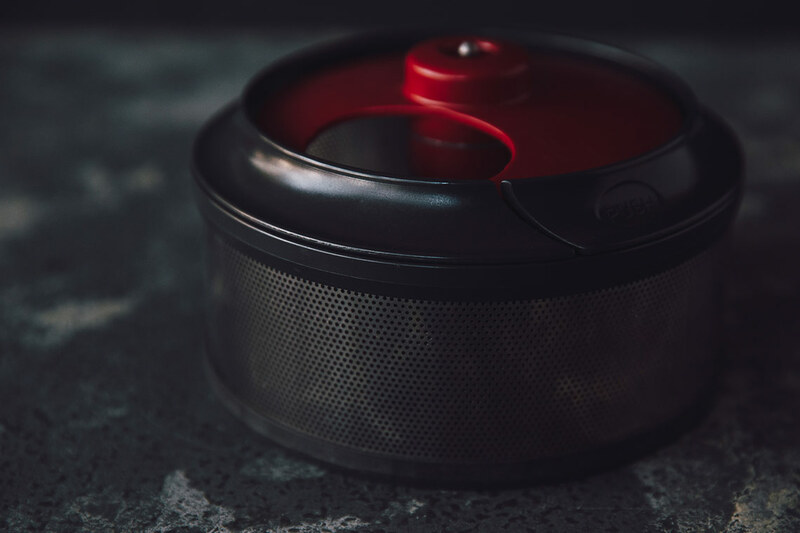 After wandering from store to store in the streets of Paris, I finally chose the Magimix Cook Expert and I explain all the reasons why HERE and then a year after, I thought I’d give you a heads up and made a COMPLETE REVIEW after an intensive daily usage. This triggered many interesting questions, some of them even made me think of different usages that hadn’t crossed my mind before (sous-vide, slow cooking, yogurt, milling) and many recipe ideas (steam cakes, jam, perfect egg, etc). I’m so glad this crazy review out of an appliance-addict brain, created so many great discussions. I noticed that many people narrowed their quest for the perfect thermo-machine to Magimix and Thermomix. So I decided to borrow a Thermomix for a little while and really do a proper study. Not the stuff you read in the very practical but insufficiently documented comparative consumer websites and magazine. These people grab a few machines, try a few recipes (in the best of cases) and that’s it. They have a precise opinion of how it works. Those machines are so versatile that it’s hard to get a proper and thorough opinion after 1 recipe or even a week of usage. I have used my Magimix for 15 months and intensely played with a Thermomix for 4 months. I made different recipes in both and compared the results. I made Thermomix recipes in the Cook Expert and Cook Expert recipes in the Thermomix. I compared milling in all the different bowls provided, but also curries, risottos, custards, stews, steaming and many more. My idea is to start by comparing the tools themselves, the functions, the accessories. I used a Thermomix TM5 and a Magimix Cook Expert I bought in Paris in July 2015. Above you can see the size of both machines. 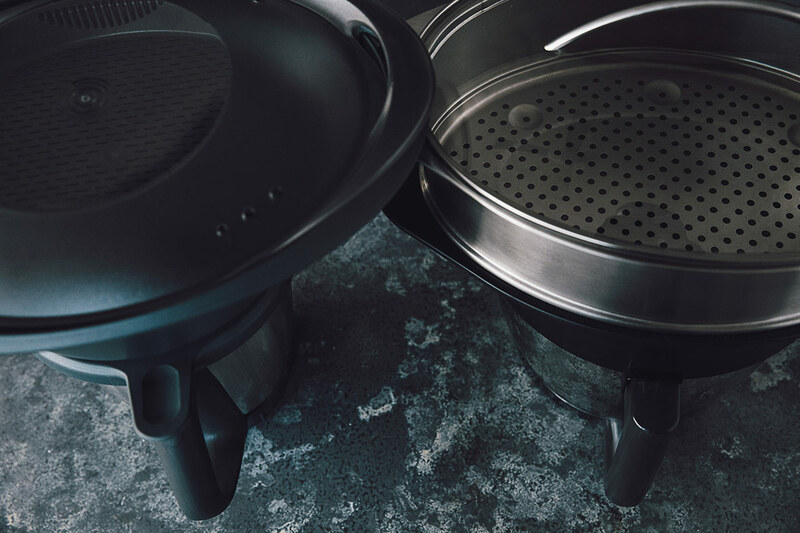 The Steamer XL with its glass lid on the right is only an optional accessory. 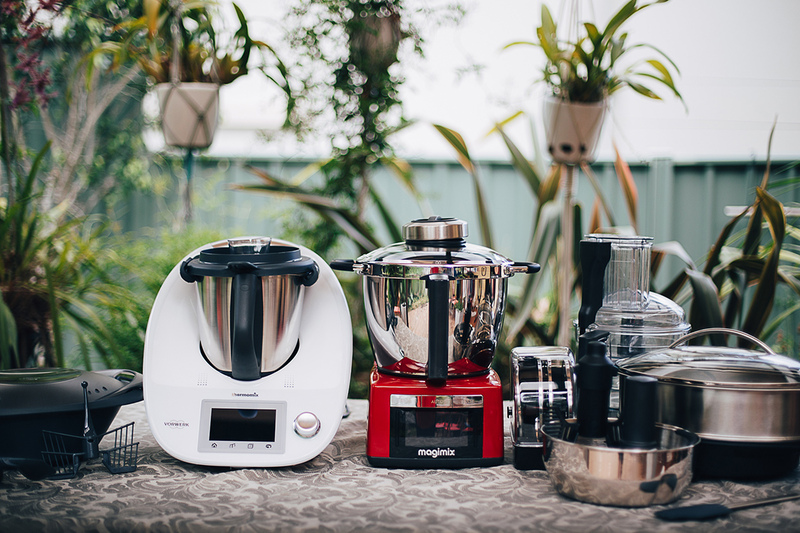 The Varoma steaming system on the left is sold with any Thermomix. Magimix comes also with a food processor and its slicing and grating disks. Let’s start by comparing in photos and descriptions, the different parts of these machines. 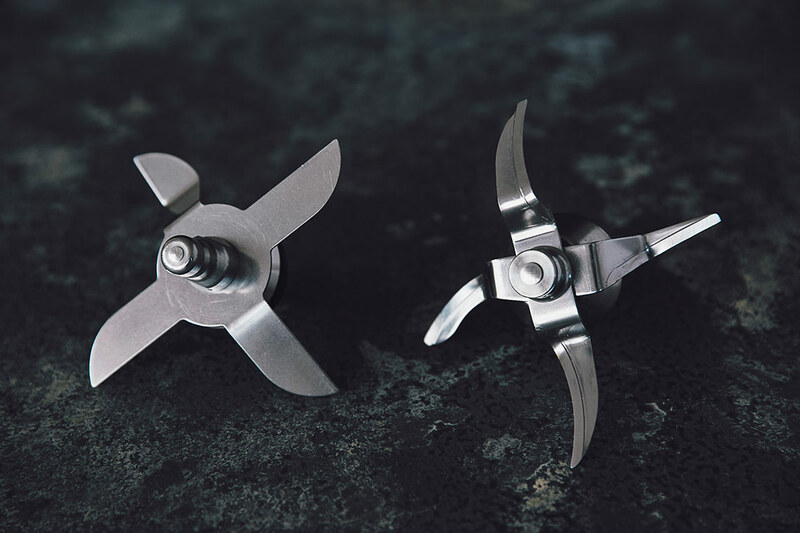 The blades are a very important feature and they’re so different. This photo above shows you underneath each blade. 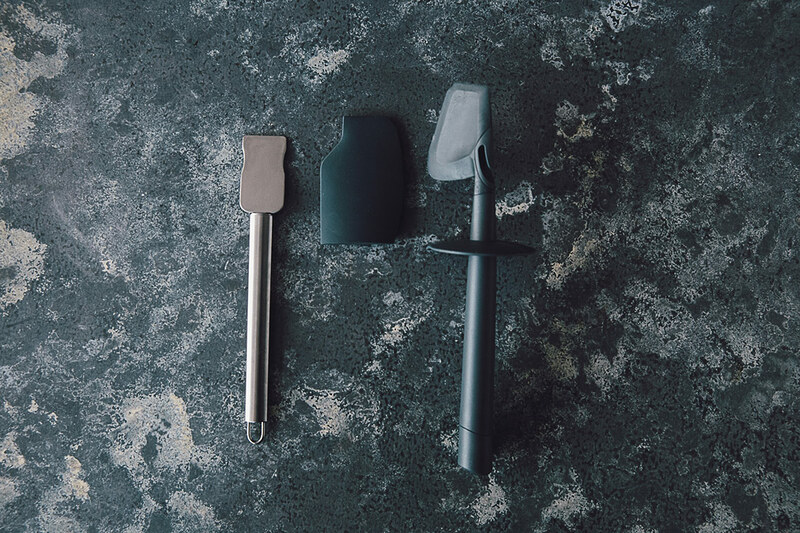 On the right, the Magimix Cook Expert blade with its metal locking ring and on the left, the Thermomix blade which locks with a plastic base. They’re both easy to lock and unlock, assemble and disassemble. They both go in the dishwasher but both also require a bit of brushing beforehand. They both are actually pretty annoying to wash when you have made a sticky preparation such as risotto or creamed rice. Now the differences: the Magimix blade is much larger and more blunt. The Thermomix blade is super sharp and finer in shape. This means that Thermomix is better at milling but needs a backwards movement to avoid mushing food which the Magimix doesn’t do. 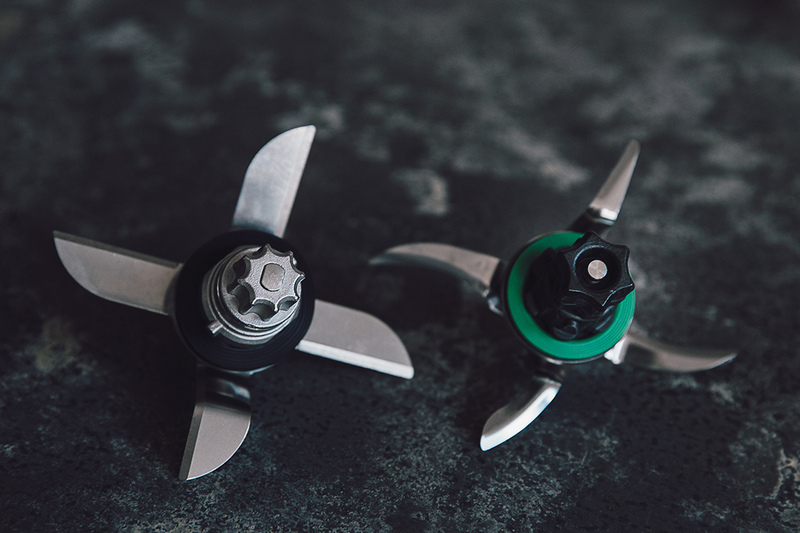 Blades seen bottoms up show that they’re built on the same concept: they’re plugged in to the motor and have a silicon seal to make the bowl water tight. The spatulas are very different. 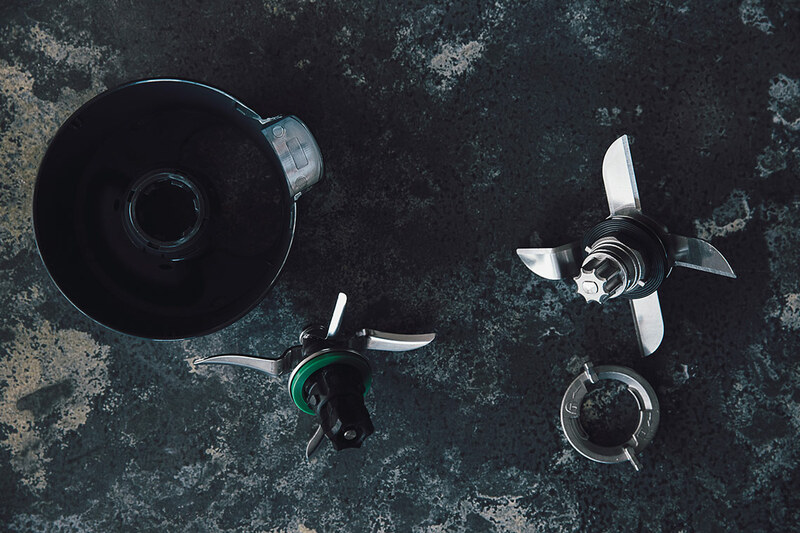 The Thermomix one has the advantage of being equipped with a stopper so you can actually stir through the lid’s opening while the blades are turning. But it is only very slightly flexible, it’s actually quite hard and not too efficient to scrape, in my humble opinion. It is also used as a hook to lift the internal steaming basket. On the left, you can see the Magimix glass lid with its plastic opening and heatproof handles. Above it is the cap which screws tightly onto the lid’s opening. At first the lid can be a bit hard to screw in and out of the metal bowl but it gets better. Inside the lid, there is a silicon ring seal which is makes the bowl perfectly watertight. If the lid is not screwed properly, the machine won’t start. The fact that it is made of glass allows you to see what is going on, except when you pulsed a smoothie or if your preparation created too much condensation. I find this feature very convenient. The Thermomix lid, cap and locking system are very different. 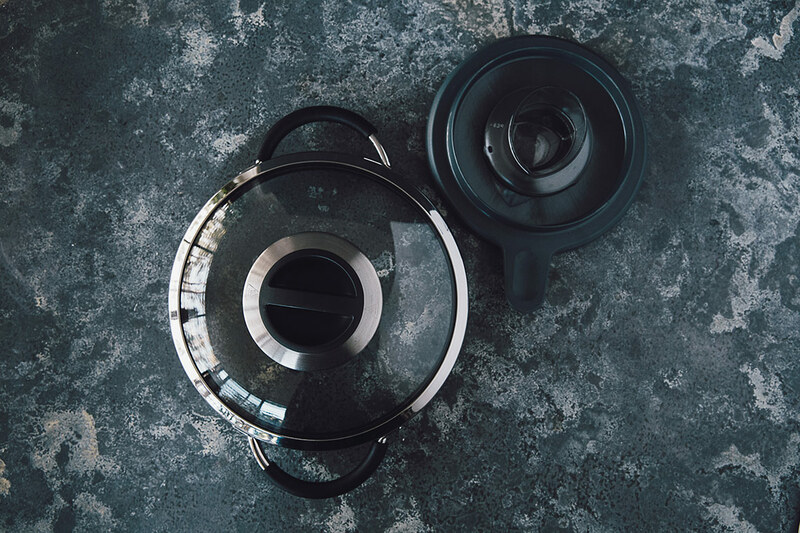 On the right you can see the lid which is placed on the bowl and locked in place by a locking mechanism triggered when the speed dial is turned on or off. This is a security feature that prevents the lid to fly away when the machine is on. This mechanism is pretty slow, as two side “things” grab the top of the bowl and its lid and pinches them together firmly. A cool feature is the fact that you can pour liquid on the lid with the cap on and the liquid will slowly enter the bowl. Open and close! This is what you do with a stove top pan and its lid all the time. It’s the same with a cooking machine. You want to take the lid off to push ingredients down the side of the bowl, check inside, taste the flavour, add ingredients which won’t go through the opening or also stop in emergency when something’s burning or something’s not going too right. This is super easy with the Cook Expert. All you need is to unscrew the lid and the machine will stop instantaneously! No need to press any buttons, stop your program, change the speed dial. Just grab the handles and open the lid. When you screw the lid back on, the machine restarts automatically where it was in the program. This makes the machine super reactive and your cooking quicker. Whereas on the Thermomix, because of this locking mechanism, you need to turn the dial to zero, and wait for a few robot noises and the side “things” to let go of the lid. It takes a few seconds and it’s annoying especially with an opaque lid, when you need to peek inside you need to take the lid off, which is less the case with the transparent Magimix lid. Note that the Thermomix cap simply sits on top. This for me is a big no no and has been a pain while I was doing these tests. I don’t like the idea that you cannot trust the machine enough to go do something else in another room. I’ve put chocolate squares in the custard recipe for example as I would have with the Magimix but it splatted milk everywhere and basically pushed the cap off. There is no security here, and the cap moves and spits liquid and flour/sugar dust at you. Users of the Thermomix over the years have found tricks to avoid the spitting such as placing the steaming basket on top. But it’s one of the not very elaborate parts of the Thermomix which makes it messy and a tad bit scary. On the Magimix, the cap is well screwed and you feel better for it when you select a very hot soup program, a smoothie or anything that pushes the food up the bowl. The whisks or egg beaters are very different but do the same job and well. They are both “clicked” on the machine’s blade. And both can beat eggs of course but also improve creams, mash, sabayons and mousses. The Thermomix egg beater had no temperature limit on the machine’s user manual (at least in the manual I got, it says that you can use it with boiling milk). The Magimix beater which came with the machine I bought a year ago had a limit of 80°C. The new version to come in the first half of 2017 will have a limit of 110°C which is ideal for Italian meringue and many other creative ideas. The bowl is very different from one brand to the other. The Magimix bowl is much larger, it can contain up to 2.5l of liquid and depending on the consistency, more volume of food. It has a complete capacity of 3.6l. 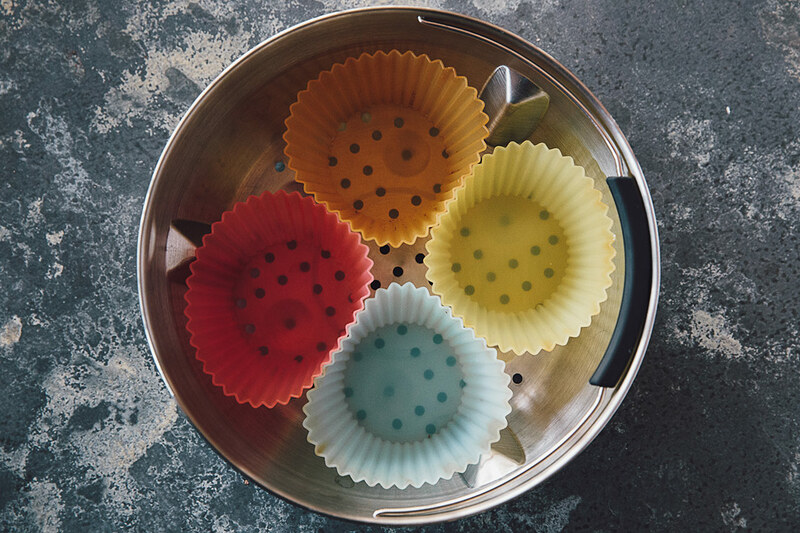 It has volume marks inside the bowl with a clear indication of the minimum liquid you need to have to use the steamer, internal or external. But the most interesting feature of this bowl is that it’s actually a double bowl. It is insulated by the air between these two bowls in one. This means that it can be handled without risk by adults or kids. It also means, most importantly, that you can make a soup a while before dinner, and if you don’t touch the lid or cap and leave it be, you can serve a super hot soup two hours later. This is a little feature that changed my life. No need to re-heat, this is such a gain of time. As a mum, being able to make in advance a risotto, dhal, soup or warm chocolate custard on a rainy day, while you give the kids a bath, or sip a glass of IPA… it’s priceless. The Thermomix bowl is not insulated, it can get very hot and it’s not advised to let kids make something hot in there or to place the machine where kids could touch it. It is smaller than the Cook Expert’s bowl. Its maximum capacity is 2.2, liquid or not. It has the serious advantage of being narrow. This helps with milling as you’ll see below and with smaller preparations. For small quantities of certain ingredients, the food stays more at the bottom than in the Magimix bowl. No difference for onions for example, you just raise the speed by 1 ever 2 seconds. It works very well. To check the capacity, I did a little experiment. I filled the Thermomix Bowl with water up to the Max dot, and poured this water into the Magimix bowl. The water reached the 2.25 bar. It looked as if there was no real difference between the two capacities. So I used a measuring cup and filled it with 400ml water thinking I would have plenty enough to fill the 250ml difference. I poured the water in and it reached the middle of the 2.5l bar with 400ml exactly! This simply means that you can make 1 more bowl of soup for your family or your guests. And that’s only talking about the liquid capacity. You can put a larger volume of solid food in this 3.6l bowl than in the 2.2l Thermomix bowl. Steam: The Magimix Cook Expert has a metal internal steaming basket with a handle, special indentations for eggs and a metal shelf for a two level steaming or even cooking simultaneously 3 things: at the bottom of the metal bowl with the blade placed on zero movement, or not, like a broth, a soup, a sauce; the bottom of the steaming basket for vegetables or eggs and the shelf for papillotte fish or chicken. These are just ideas, you can probably think of many other things you can cook simultaneously savoury or sweet. Thermomix has a small plastic steam basket (in the middle of the photo above) with no handle but a clever system of lifting using a special hook on the spatula. 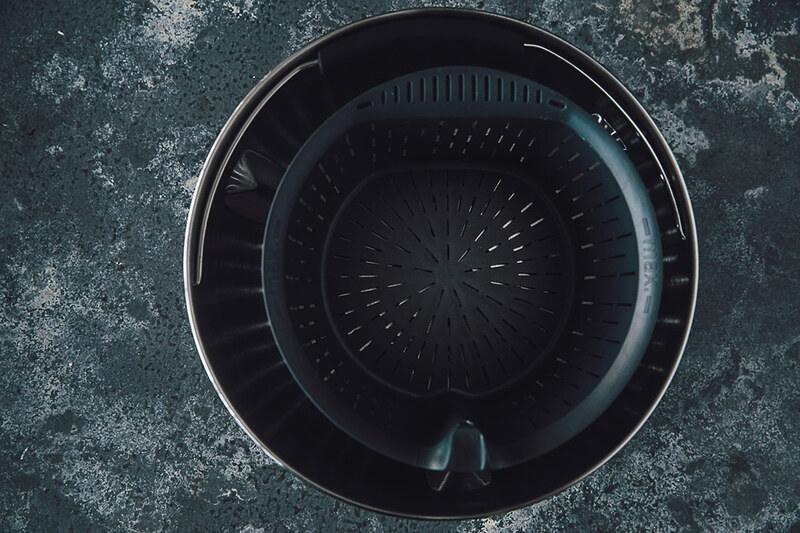 It allows you to cook on 4 levels if you’re using the big Varoma steaming basket on top. And it’s the same thing as the Magimix, you can cook broth at the bottom, veggies or rice or couscous in the mini basket, veggies and papillote on the two top levels (Varoma). The mini basket has also an interesting use. 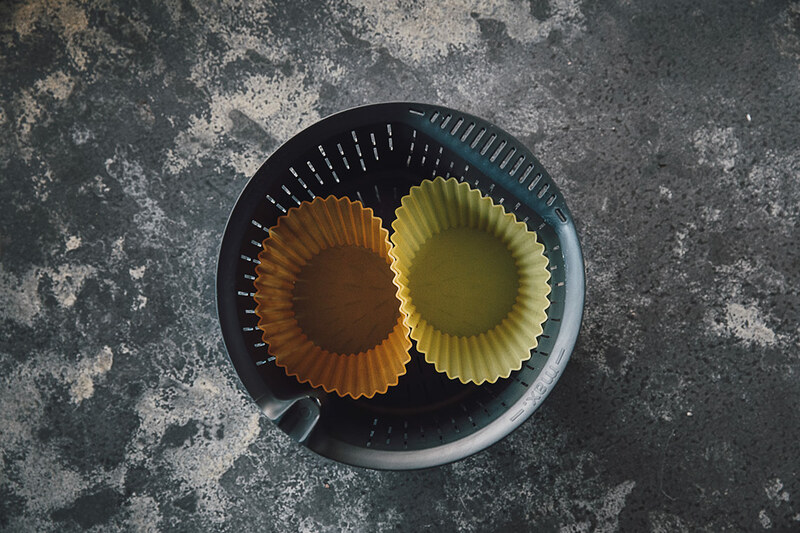 Imagine you’ve made a preparation which needs to be drained, you can simply place the basket in the bowl, holding it with the rigid spatula and the liquid will pour out while the solids remain inside the bowl. To compare the capacity of theses internal baskets, I’ve used silicon muffin size patty pans. You can squash 2 of those in the Thermomix basket (photo above). And a bit less squashed, you can put 4 in the Magimix basket. 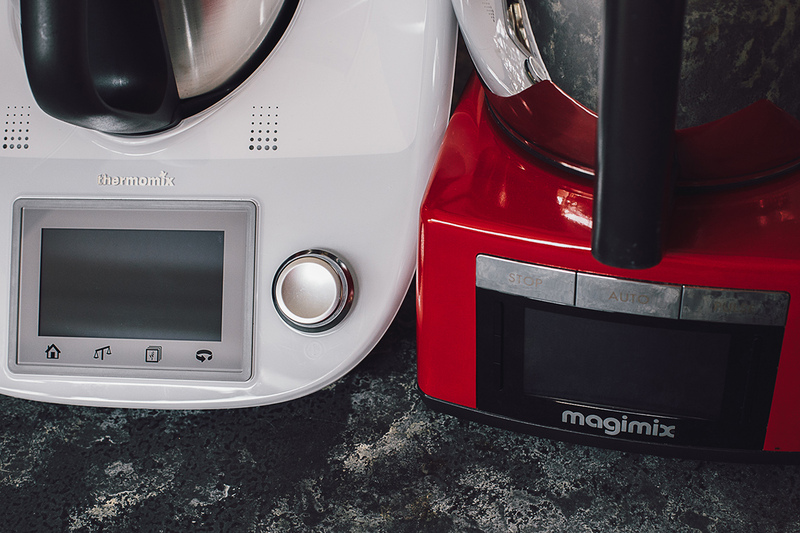 I wrote a complete article to compare the two top steaming systems: Steamer XL by Magimix, an optional accessory that will probably be sold in Australia during the first half of 2017, and the Thermomix Varoma, which is sold with any Thermomix. You can read it HERE. One major difference between the two thermo-appliances is the scale. Thermomix has an integrated scale which is an absolutely fantastic concept. You can add the ingredient without taking the metal bowl off, or using more plates or bowls which you’ll have to clean later. Magimix refused to do this. They provide a very good electronic scale (the first edition was quite bad but the new one, sold for nearly a year, are really good). Their argument is to say that the Thermomix scale is very inaccurate and that is actually true… If the cord is pulled a little or resting on the fruit bowl, it’s going to affect the weight. If something touches the machine, it affects the scale too. If you regularly move the machine by pushing around without carrying it, you damage the feet which are the base of the scale. That being said, when you make sure that the cord isn’t pulled, that nothing touches the sides of the machine and you’re making a pretty simple recipe, it’s soooo practical. I’ve talked to chefs and they told me that if they’re making precise recipes they will not use the Thermomix scale but if they’re doing a recipe where the ingredients’ dosage can be a bit approximate they’ll use it. And to be precise, the Thermomix internal scale has a 5g accuracy and the Magimix external scale has a 2g accuracy. Another part where the two concepts are very different is the control panels. They both have a colour LCD. But Thermomix has a touch screen and a round knob dial. Its screen is slightly at an angle, facing the user, which is very practical. On the Thermomix screen you can access the recipes, the integrated scale, the Turbo function (sort of pulse) and the reverse function by direct access icons at the bottom. The middle of the screen shows you recipes which guide you through each step with quantities and time + speed instructions. There is also a “free” mode where you can select speed, time, temperature by touching them and turning the dial to go up and down. This is very quick and efficient. It works very well when you have wet hands. Once you’ve pressed on the dial knob, it takes a little while for the machine to be operational. The Magimix panel is made of buttons you can push. It switches on immediately by pressing any buttons and you can start selecting your program straight away. Despite the fact that if you keep your finger on a button for a while it will go up or down faster, it is a much slower system than a dial knob. To select a program, you need to press the left or right arrows, then press OK to get into the choices under each program. Then, when you’ve chosen your program, you have to either press AUTO (which basically means Go!) if it’s an automatic program or change the settings by selecting each setting using the arrow buttons, and the go up or down in these setting pressing + or -. It is fiddly and annoying. I’ve asked someone from Magimix about it and he told me that anything that pokes out is more likely to go through technical problems eventually, that’s why they opted for the push button solution. I must admit that I would have preferred dial knobs which would make the menu easier and quicker to navigate. Thermomix offers an internal recipe book that you can access through the LCD screen by placing a chip on the side of the machine. You can buy more recipe books and chips online for around 50 AUD. The machine is sold with the Basic Cook Book (200 recipes) and its chip which both contain the same simple recipes. You can select a recipe on the screen’s menu and follow the step: “pull out X ingredients in X quantity”, “weigh this, pour it in, stir for 3 min”, “weigh this other thing, pour it in, stir for X min”, etc. It’s probably very interesting for people who have never cooked or skip lines in recipes. For the rest of us, reading this on a screen or on the back of a Philadelphia box is the exact same thing. To me it’s more of a gimmick than a really indispensable feature. I can read, I can weigh things, and I can do that at my own pace without a machine telling what to do. I found myself skipping all the steps and finally stopping the machine to switch to freestyle mode… I’d like to get the feedback from those of you who’ve use these dictated recipes. I had a bad experience with the custard one. First of all the Magimix custard one is simple: put all the ingredients in the bowl; choose a temp, speed and time; press Auto. And a few minutes later you have a custard. As it heats straight from the start, you can melt things in such as white, milk or dark chocolate. When I attempted my dark chocolate and honey custard (Gosh I need to work on my recipe backlog here…) the program being different, starting by putting the ingredient one by one and stirring without heating, the squares of chocolate started to bang on the side of the bowl, and the machine started to move and spit and I panicked!! I had to hold the Thermomix down with a towel. The result with the amount of sugar and corn flour (for the runny version) was extremely thick and horribly sweet. Other recipes were much less traumatic but then again if this Thermomix was mine, I would buy Thermomix recipe books, the ones recently published, not the old German stuff, I’ll keep on buying the Tmix magazine (even if their last gnocchi recipe was horrible) and I’ll use it as a great tool dialling the speed, time and temp by hand. What Thermomix doesn’t offer is any automated program where you put all your ingredients in and it does the work for you without your intervention. That’s a shame, because these ones, which Magimix gets his success from, are simply magic. No fiddly steps, everything goes in and you go have a bath. 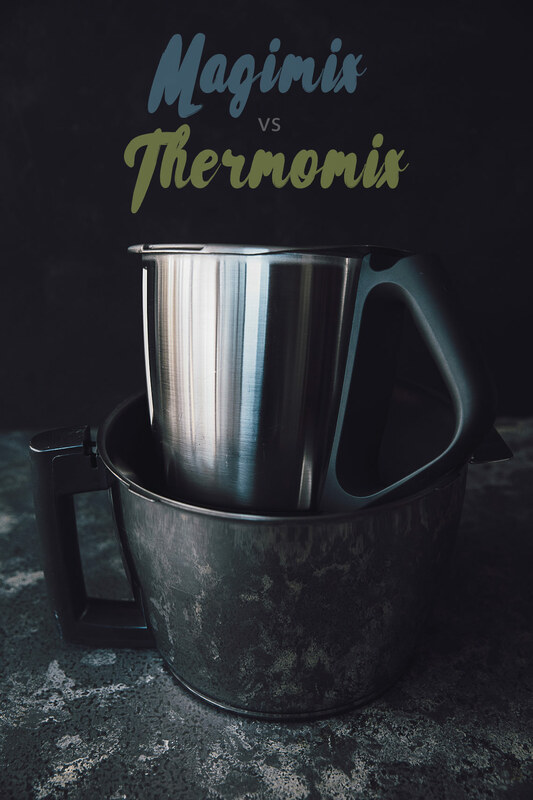 Last but not least, Thermomix was born more than 40 years ago and even with a long dormant period with pretty confidential sales, it has accumulated an extraordinary wealth of recipes, tips and tricks. The Thermomix community is super active and creative. Without buying any book, you’ll be able to cook 3 new recipes every day during the rest of your life without making anything twice! These for me are 10 times more interesting to have than step by step screen recipes. The Cook Expert comes with a really good mainly French inspired cookbook of 300 recipes. Both appliances give you access to plethora of online resources. 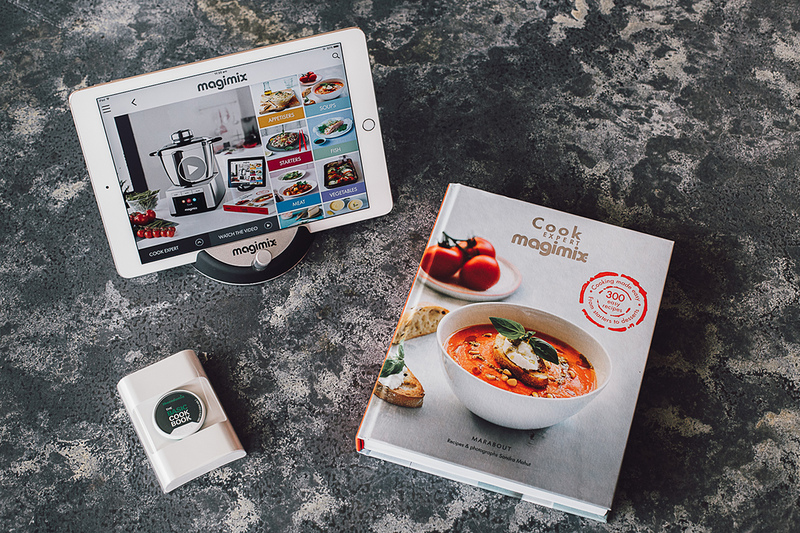 Magimix has a great app and so does Thermomix. You can binge watch, like I did, Magimix cool Youtube channel and this one by Thermomix Australia as well. Hundreds of thousands of people talk about these machines and share recipes. The cool thing is that you can totally interchange machines for any given recipe. You gotta know your machine and trial and error at first. I’m preparing a cool conversion table which you’ll be able to use. Noise and sounds: Magimix is less noisy than Thermomix and by a long shot. Especially during milling and ice crushing. It’s probably due to the double walled bowl and the tight cap. The beeping is very audible but not recurring and “simple”, just a beeeep. Thermomix is a noisy machine and sometimes it becomes scary (try a custard with chocolate squares using the custard program…). Pouring: Both metal bowls give excellent pouring results. Magimix has a strange flat bit which at first I thought was a joke, but in fact, it’s perfect to pour anything liquid or viscous. It works a treat. Thermomix looks like it doesn’t have anything to pour properly but the side of the bowl opposite to the handle is flatter and this makes pouring easy and efficient. I’ve read people complain about it but I never had problems with it. Leakage and dust: Due to the cap that just sits on top of the lid, Thermomix spits and throws dust at you such as icing sugar or flour (see Milling video below). It doesn’t happen with Magimix at all as the cap is heavier and even if it’s not securely screwed to the lid, it stays in place and avoids any spitting. What happens with Magimix though, that doesn’t with Thermomix is lid dripping. Don’t get me wrong, the lid is totally water tight and won’t leak. But when you take it off after mixing a liquid preparation, you can do your best to make it drip in the bowl, but most of the times, it’s gonna drip around the bowl and the machine. It’s much easier with the Thermomix lid which is smaller and easy to make drip in the bowl. Slow stirring: Thermomix has a “soft spoon stir” function that can go in reverse. It’s a patent Thermomix has on its blade. One side is sharp, the other blunt. The reverse function stirs without chopping. It’s a great function for fragile food. Magimix has a zero movement of the blade setting which Thermomix doesn’t have. This is a great feature for sous-vide, slow-cooking, one-pot pasta, or anything for which you would leave in the pan on the stove without stirring. It has to alternate speeds: 1A and 2A. They both work at a similar speed as 3 but with a no stirring pause in between. The 1A stirs less regularly than the 2A. These are much faster and energetic than the gentle spoon stir function of the Thermomix. This aspect worried me when I got the Magimix. But surprisingly, the end results are the same. If your stew meat is super tender and fragile, you can cook it in the Magimix at 1A or Thermomix with its reverse “gentle spoons stir”, they both will end up in a mush anyway… But if your meat holds itself both programs will achieve a very nicely shaped stew. Magimix has the advantage of the “no stirring” speed. If you have a fragile ingredient, you don’t need to stir it. Washing: Both machines’ accessories go in the dishwasher which is a godsend… You can unscrew the blade and put absolutely everything in the dishwasher and it stays super new. Of course you can’t put the base in the dishwasher and both machines are cleanable with a damp cloth and mild soap. Magimix has a rinsing program which I systematically forget to put on. I just soak sticky stuff, use a brush to get rid of the chunks and put it in the dishwasher. I guess that putting warm water and soap using a high speed in the Thermomix would do the same. The Magimix bowl can get water inside the handle while in the dishwasher. This means that it leaks quite a lot of water when you take it out. You need to rest it in the sink or in the dishwasher before putting it back on its base. I heard people say that there is a special position which can avoid that but I can’t figure it out. Transport: Thermomix is easier to transport as it is lighter and has a handle at the top of the base which makes it practical to move. 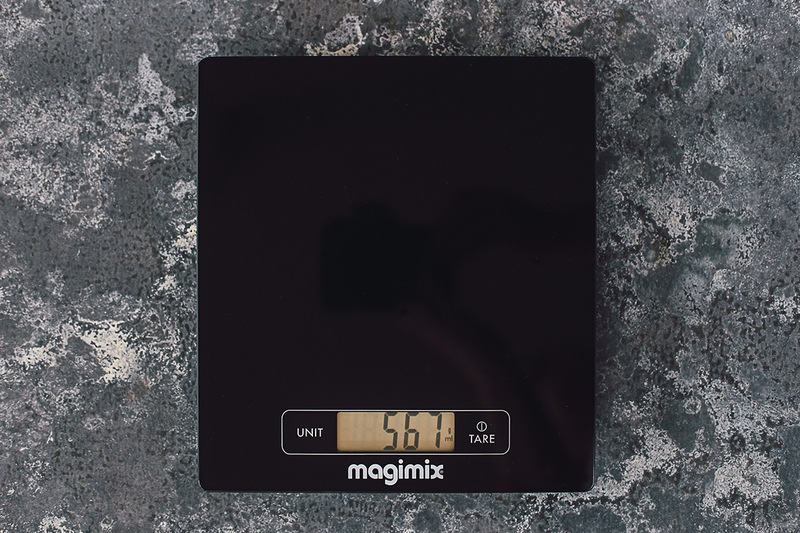 Magimix has two indentations, the size of half a hand under the base. You can transport it that way. It’s also quite practical but it’s a heavier machine. Looks and materials: Thermomix is round in shape and has a screen looking upwards which is very practical. It has a handle which is also pretty handy. It’s made mainly of plastic and doesn’t look very sturdy. The one that was lent to me had a major crack in the plastic in front. Temperatures: First of all, Magimix has got induction as a heating system, Thermomix doesn’t. 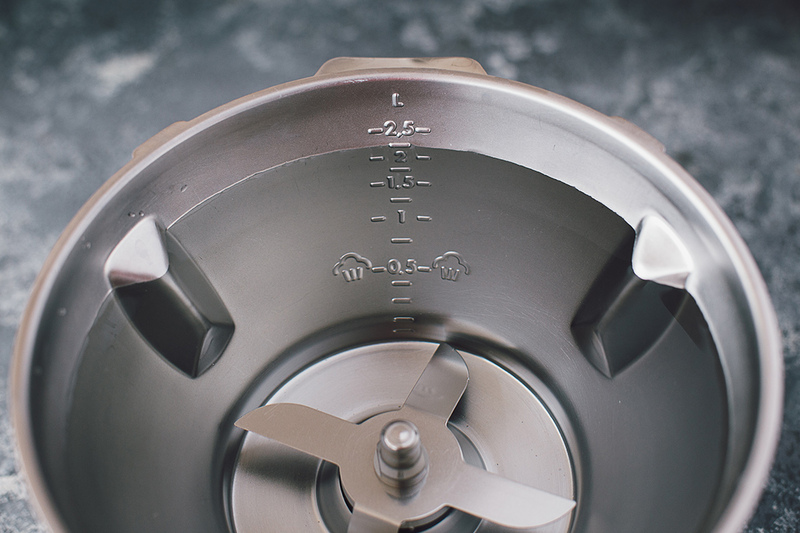 This means that the Cook Expert is very precise with 1°C increments and can go low and high in temperature: 31.5 to 140°C. The Thermomix is not that precise with a 5°C temperature increment. It ranges from 37°C to 120°C. Motor: Thermomix is 500watts and 40 (gentle stir) to 10,700 rpm and Magimix 1,700 watts and 250 to 6,000 rpm. Danger: There have been many dramatic accidents with the Thermomix. I haven’t studied them or known anyone personally so I’m not going to comment on them. I recommend that you do your own study on that part and check the do’s and the don’ts of the usage of a Thermomix. As I said in this article many features of the Thermomix are a bit scary, the jumping cap, the spitting, the noise and the wiggling. I haven’t had an accident, touch wood, but I find that this machine doesn’t give you a secure feeling. Warranty: Magimix wins that one with a 3 year warranty on parts & accessories and 1 year labour. The motor itself has a 30 year warranty or 1000 hours usage. Method of sales: Thermomix is sold “in reunion” as we say in French. You cannot find a Thermomix in a shop. You have to know someone who is a Thermomix local seller and who is going to get a margin by selling it to you. It feels a bit like a pyramid scheme which makes me slightly unconformable. Magimix is a very famous French kitchen appliance brand. It is sold in most kitchen appliance stores. 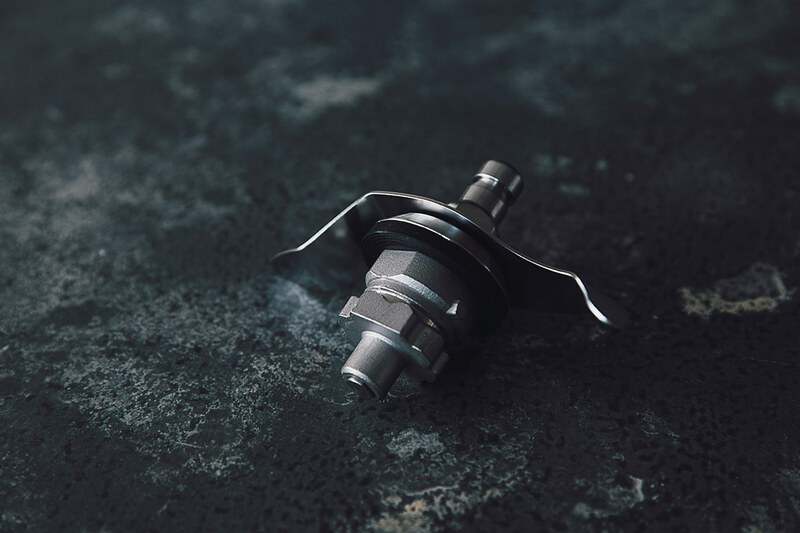 Milling is an ongoing subject between Food Processors and Thermo-machines. It’s something that people want to do more and more to make bread of course but also cereal milks. You can mill wheat but also rice or any other grain. So my first test was to grab a cup of wheat and place it in the Thermomix bowl, then one cup in the Magimix metal bowl and finally one cup in the Magimix mini plastic bowl of the food processor. I ran the max speed on the Thermomix for one minute. It created a coarse flour at the bottom and a quite fine dust on the side (3 to 5 mm of it). This flour was very usable for bread making especially of you mix it with commercial baker’s flour. I also ran the max speed on the Magimix for one minute and the result was super coarse with a few intact grains of wheat. I ran it again for 1 minute 2 times and the result was finer but still coarser than the Thermomix one. I use very regularly this coarse flour in my bread (20 to 30% in average) and the result is very nice. You can see in the image above: from left to right, Thermomix 1 min at max speed, Magimix 3 times 1 min, Magimix 1 min. In the left video below, you will see these experiments. There are some interesting facts you can see there too: Thermomix lets of clouds of wheat dust a lot while it’s milling. It is very, very loud; much louder than Magimix. As a conclusion, Magimix can mill and you can make bread or roasted milled rice (great for Crying Tiger or Mince chicken Thai salad) but it’s not as efficient as Thermomix. Two reasons for that it seems: the shape of the Thermomix bowl, more vertical and narrower helps the grains come back to the blade; and also because the blade is much sharper. None of these machines can properly mill flour as a milling stone (my next obsession) can do. Thermomix get the finer results but it’s far from being a fine flour. Also, using blades and speed heats the ground wheat and alters its oils. Pro bakers recommend not to use a mixer or food processor to make bread flour and tell you not to store it because it becomes rancid quite quickly and loses its nutritional qualities. That being said, I’ve used my Magimix coarse flour (and the Thermomix one while I have it on the bench) in my daily bread and it is very tasty. But of course, I’m not a scientist :) I don’t know if the oils are harmed or not… It just tastes super good. If you want to grind spices, you can use the metal bowls of both appliances and also the plastic food processor bowl of the Magimix. This experiment with wheat didn’t work there because of the nature of wheat: super hard. Coriander or cumin seeds will be turned into a decent powder in the metal bowl or the food processor mini bowl. 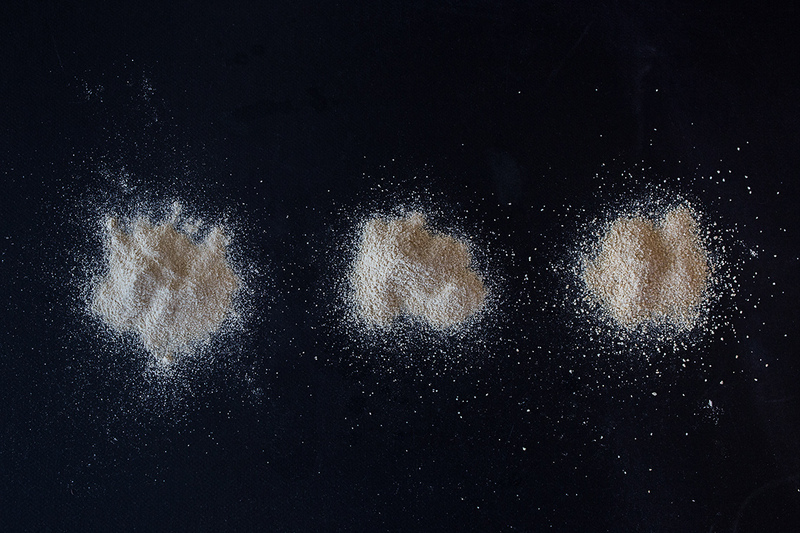 Parmesan, sugar, chocolate, turn into a super fine powder in both machines, with exactly the same efficiency. Let be straight, as you know I’m a bit of a bread snob and both standard blades do not convince me for bread making. I’ve tried both and it doesn’t knead the bread as well as a dough hook and your hands would. My new toy is the Magimix Dough blade. I make great sourdough breads with it. It sold separately in France and will be available in Australia first half of 2017. 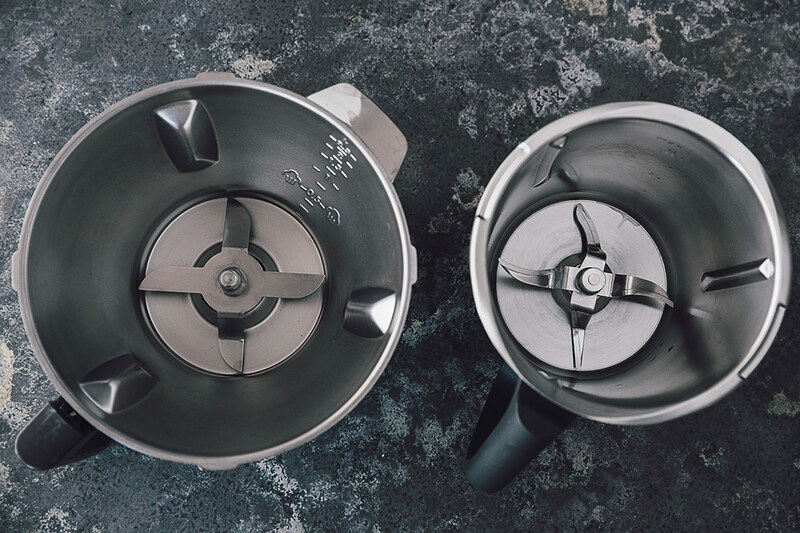 One big advantage of the Magimix here is the possibility to proof/raise the dough in the bowl using the low induction temperature and the zero movement blade setting. This saves the day when the weather is cold. It makes fantastic loaves of bread. I use this function nearly every day. Both machines make a great curry and if the recipe is good (very important) you can get perfectly shaped morsels of meat. It’s the same thing as any stove top recipe, you can get super rubbery chicken or the completely shredded version. I used the same recipe on both machines adapting the speeds to their equivalent as much as possible and I’ve had great results in both. If Thermomix has the slow and gentle spoon stirring program with patented reverse blade system, Magimix’s energetic 1A speed does a great job too. If you have a very delicate ingredient or preparation you can set the speed to zero. You cannot do sous-vide cooking in the Thermomix because the blade cannot be set to zero movement. You don’t want your vacuumed bag to be pierced by the sharp blade. Also, the temperature is not as precise as the Magimix’s 1°C increment. Despite the quite bad built in recipe the Thermomix has, if you use a simple good custard recipe, such as crème anglaise without starch or corn flour, or thicker anglo-saxon custards, you get great results in both machines by setting the speed, temperature and time according to a recipe. Magimix wins here. Both its puréed and creamed soup programs are gems. You can achieve a very silky result in the Thermomix too but you have to intervene on the machine to change the speeds. It’s not a 1 program and you go somewhere else kind of recipe. As diary free diet is all the rage at the moment, substitutes such as almond, rice or oat milks are very useful. In most recipes you soak the nuts or cereals and blitz them then using a nut bag (a bit like me) to press the juice out. Both machines need to go at very high speed for that one and as usual, I feel more secure using the one that has a screwed cap instead of the one that has a jumping cap. Advantage to Thermomix here especially if you have big frozen chunks of fruit. I have tried a mango sorbet with 5 x 1.5 cm chunks, sugar and 1 egg white; I also tried with three frozen pears cut in 8, in both in the Magimix and Thermomix. Magimix had so much trouble, the blade was simply turning uselessly without chopping anything. I tried everything, going slowly from low to high speed, pulsing… It took 20 minutes to create these nonetheless delicious sorbets. Thermomix had trouble too, and started to do the same, turning without chopping but it ended up doing its job within 5 minutes. Instant sorbets work a treat with both machines if you cut your fruits in small pieces and add ice cubes for more moisture. Things I haven’t tried yet but I’m willing to test in the coming weeks: yogurt, jam, perfect egg, steamed eggs, slow-cooking. Well, that’s what I thought for years… But since I got it, I’ve started to make more grated zucchini and carrot salads, I stopped buying this awful commercial grated cheese full of starch. I made my own steak tartare with super fresh meat I buy at the butcher especially for it (try hanger steak) or salmon Thai tartare. 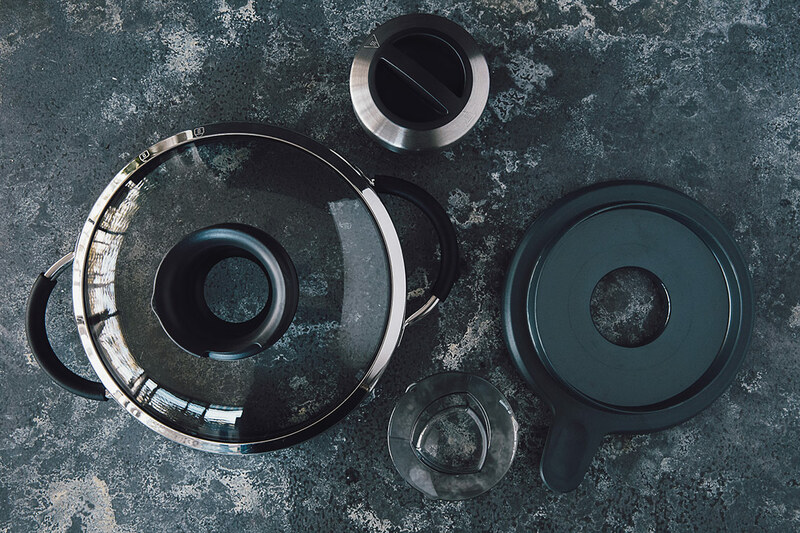 The difference with the metal bowl is that you can manage the consistency with great precision. The transparent wall of the bowl lets you see through the chunky or pasty texture you want to achieve. The pulse button is quick and precise. The mini bowl is fantastic to chop nuts, make dukkha and Asian sauces with all their ingredients. It contains 3 bowls, a mini, a medium and a big one. The small one has a small blade for smaller preparations. The two other bowls will fit the large blade or the slicing/grating disks. I will not try to enumerate all the accessories available for these machines but basically Magimix has a large variety of great optional accessories and Thermomix has none. I’m not talking about the free silicon mat or insulated stainless steel bowls that Thermomix sellers get as a reward. I’m talking about tools you can add to your machine to make it even more versatile. What people seem to use the most are the juice extractor (photo below), the citrus press, the cube/fries cutter, and the fancy disks to cut veggies in a more artistic way such as julienne (fine strings), tagliatelle or wavy/corrugated shapes. There are also different thickness slicing disks and different calibre grating holes. There is the “parmesan + chocolate” disk but I think that it’s a bit of an overkill with a machine that does a perfect powder in the metal bowl at speed 18. Let’s see just the three that I use all the time. This accessory replaces a juicer very well. It come with a little recipe booklet. As any juicer filter, you gotta rinse it quickly after using it. It goes in the dishwasher. This optional accessory will be available in the first half of 2017. Here again I wrote a complete article about it HERE. You can make bread and people do it very successfully with the universal blade but this is a bit of a game changer if you’re a sourdough baker and like it to be like a French boulangerie. The new accessory for the Magimix Cook Expert is the Steamer XL. 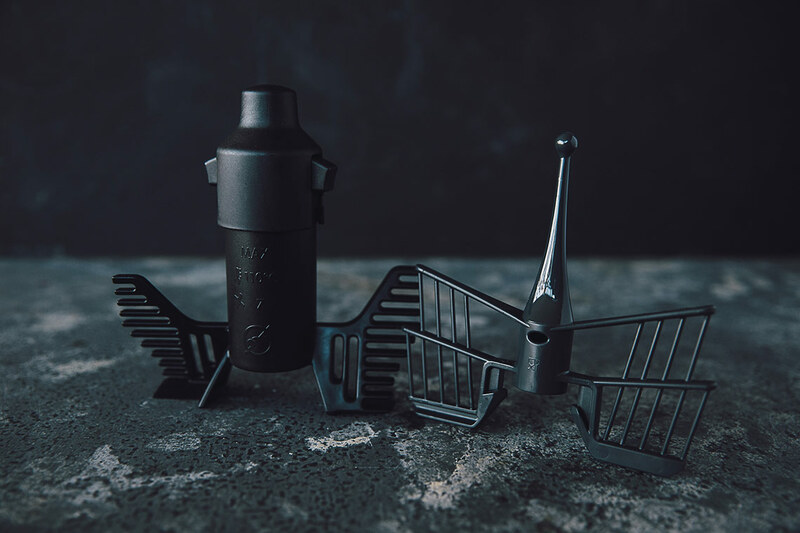 I wrote a whole article on the comparison between the Varoma and this steamer HERE. 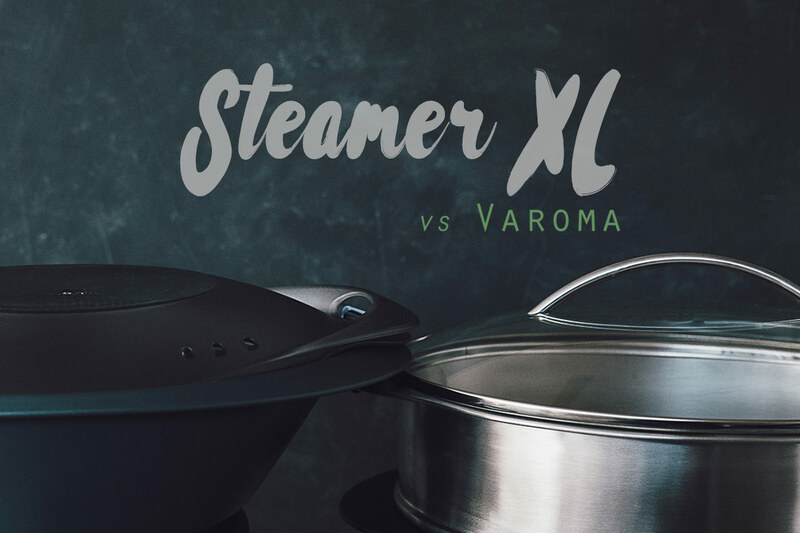 The steamer XL has a bigger capacity than the Varoma. See the photos and video in my article. It’s important to note that this accessory is sold separately whereas the Varoma is sold with all Thermomix machines. And that’s only for me. You might have completely different criteria. I hope that this geeky study, which I really enjoyed doing, helps you see these machines under a new light and helps you to make the right decision for you and your family or posse. If you have had a similar or very different experience with those machines, let me know. I’d love to hear from you! If you want me to test something, let me know in the comments and I’ll do my best to do it. This post is not sponsored as I haven’t been paid for it however the Steamer XL prototype was shipped from Paris to Sydney by Magimix for free, for me to test it. The Magimix Cook Expert is mine :) The Thermomix was lent to me. My Cook Expert “opening of the box“: I chose Magimix. My complete review of this machine. Magimix Cook Expert improvements for 2017. New Magimix Cook Expert XL Dough blade or hook. Magimix Steamer XL vs Thermomix Varoma. If you’re ever up to testing the Kenwood Cooking Chef Gourmet, I’d be very interested in reading the results of that test. I had no problem choosing between the Cook Expert and the Thermomix but I didn’t know about the new Kenwood at the time (180° cooking, dials, true “patissier” bowl and accessories etc…) and have been wondering if I made the right choice with my Magimix which I find a bit deficient when it comes to its “blender” functions. The bowl is way too large for it to do a great job and that’s a problem for me because I do need a good blender. Also, could I ask for you favorite Risotto recipe? I’ve tried the one from the Magimix recipe book and didn’t really like the results, texture-wise. I found it too compact and mushy compared to a risotto done by hand. Since I’m a great lover of risottos, I would love to find a great recipe for my MCE. Thank you for your comment Sandy. I haven’t tried the Kenwood Cooking Chef at home. I just played with it in a store in Paris. What I didn’t like was the top part which is always in the way. I didn’t like that at all with my standard Kenwood chef. I spilled things outside the bowl, never had enough room to work properly. Also I have had a very bad experience with this machine which was totally crushed after only 4 years of use. I use the Magimix for very smooth hot and cold soup, instant ice-cream, smoothies and ice-crushing or icing sugar making. I find it very efficient. The only thing I wish it was more powerful for is the milling. I’m a risotto fan too :) I find that it’s easier to fail with a machine than taking the time to do it by hand stirring patiently standing at the stove. But if you take the time, on several occasions to tweak the recipes you have, and try a few different (good quality) grains of arborio rice, you’ll get great results and gain time in the future. The difficult part is to find the right grain, the right liquid/solid ratio and the right cooking time. I’ll check my brand and will let you know. I put more liquid than the Magimix recipe because of my rice. It’s better to have it a bit runnier because it will “solidify” a little bit when you serve it. I add the veggies or meat just 3 mins before the end of the program. I don’t wait to serve. Your comment makes me feel better about having chosen the Cook Expert then. I was really envious of the “patissier” bowl and accessories + glass blender of the Kenwood. I don’t want a machine that breaks down after 4 years. I’ll publish my risotto recipes as soon as I can. you couldn’t believe the backlog I have a t the moment! I have a black/white pepper one which is spicy and super good. You’ll find one with fresh pear and prosciutto on the blog. Have you tried the food processor bowl (the small one)? Oohhh, the white/black pepper risotto sounds delicious! Can’t wait. I’m a vegetarian so the prosciutto is a no go but I have a caramelized pear/gorgonzola recipe which is to die for. I might try to adapt it to the MCE since the recipe from the Magimix book was disappointing. I have tried the small food processor for various things and it works well for dukkah, spices, hummus etc… but won’t work at all for beverages (or salad dressings) since there’s the problem of the liquid spilling over to the other two bigger bowls. You don’t need the prosciutto at all, Gorgonzola and pear will be perfect and if you need a salty/meaty touch, fried mushrooms would do the job. What about the smell on joints and plastic parts? There are few plastic/silicon parts on the Cook expert but on my opinion, they keep a lot the odor of the meals (really a shame). And as I cook spiced meals (onions, curry, coriander, soya sauce…), I can smell the odor even after cooking something else like a soup. And I’m a little disappointed by Magimix after sale services in France. It’s not as friendly and efficient as it was previously. I don’t know how it is with Vorwek. Have you planned a comparison between Companion & Cook expert? I really like Moulinex customer services around the companion – website, online shop, user forum and so on. Shame the companion lid is plastic and not glass. Thank you for your comment and your emails. I had to do with them when I was in France for my Mum’s coffee machine and they were ultra efficient, and sent a part for free! Maybe the Christmas rush followed by the French Sales make things a bit more slow this time of year. Regarding the odours, all silicon and plastic bits do smell after a spicy meal when the cook in it (especially warm), all of them… I find that the Magimix smells a lot less than the Thermomix, probably because it has much less silicon/plastic. And they both don’t smell that much to my opinion. At least in the Magimix the plastic/silicon bits do not touch the food except the whisk which you’d use mostly in cold preparations or Italian meringue. If you want to make curried purees with it ;) and you feel the smell could affect your future egg whites, I’d recommend buying an extra whisk which are quite cheap. In the Thermie, the steam basket internal and external are in plastic, the whisk and the lid are too. I haven’t been bothered much by the problem but when I want to get rid of a bad smell on a silicon spatula for example or some silicon moulds, I simply soak them in warm water with lots of cheap white vinegar. I don’t know anyone with a Companion in Sydney :) If I did, I’d love to borrow it and do the same experiments with it. It’d be fun. You’re right Moulinex is also an excellent brand. It has been great to read your review. I have owned a Thermomix for about 18 months now and love it. My other major kitchen appliance is a Magimix Cuisine System 4100 processor which I’ve had for several years. Many people seem to sell their food processors once they buy a thermomix but I am loathe to do so as it is such a good machine and so powerful. I can see the huge benefits in owning the Magimix Cook Expert as it is 2 machines in 1, having said that though I very rarely use my food processor now (e.g. slicing bulk onions for school BBQs or slicing kg blocks of cheese). One thing about the Thermomix that I have come to appreciate greatly is the ability to mill really well as I mill seeds, buckwheat & rice. It blends amazingly well which I put down to the narrowness of the bowl at the bottom & sharp blade. For a while I thought it couldn’t blend well but I didn’t have it on a high enough speed or do it for long enough – around 30 seconds is fine. The Thermomix also makes amazing sorbets/ice drinks and I’ve found that the trick is to insert the butterfly whisk after a few seconds when the ice is pretty small. I use small party ice in bags so that helps too. The butterfly whisk picks up all the ice from the sides & channels it all to the blades, resulting in a lovely sorbet/ice drink in less than 30 seconds – maybe it would work well in the Magimix too. I never really thought about the spitting, moving & loudness of the Thermomix but you’re right – it does all those things and if you don’t know any better you don’t realise! I do love it though and find these days that I use it a lot for baking as it does things like cream cold butter & sugar better than anything else and so quickly. It makes great soups too & I love the quirky cooking creamy chicken and brown rice soup. It is a fantastic rice cooker & steamer too. I would recommend purchasing a cooking machine like the Thermomix or Magimix to anyone. 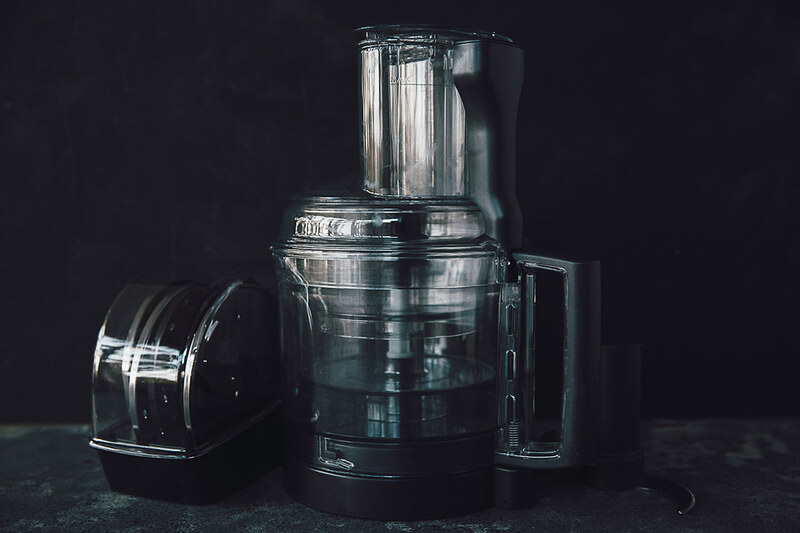 If you regularly needed to juice, slice etc and/or had a big family, the Magimix looks like it might be a better bet although I do love cooking with my Thermomix. I enjoy great support from the salesperson who sold it to me via emails and regular demonstrations where I get to see and taste lots of dishes cooked in 2 hours. Thanks! Thank you very much for your comment! It’s so nice to see that these thermo-machines are a real help. They’re not an expensive thing you buy and then hide in a cupboard. I do use my food processor a lot, especially for tartares (to which my family is addicted, being fish or meat), vegetable slicing when it’s a lot (French dishes such as Tian de légumes or potato gratin dauphinois) it makes things sooooo much faster and easier. No need for a heavy wash either, I rinse everything in very hot water. The ice-cream trick is great! Thank you for sharing it. I will try it very soon (the weather is so hot here at the moment). I’m sure it does something fluffly and lovely. I love demonstrations :) It gives you new ideas and as a mother of 3, they’re always welcome! At the moment I’m looking for new lunchbox goodies the kids won’t trade for a nasty chocolate bar or put in the bin!! Great and unbiased comparison. I am seriously thinking of getting the MCE, how would I know if its the latest version – ie. the one with the 110 degree whipping limit, and any other improvements they’ve done? I haven’t done the conversion table yet, I’m totally overwhelmed by my videography and photography work at the moment. But I promise I will. I took a lot of notes while I had both machines. So I need to work on that and will write an article. Promise!! That’s no worries at all! I will wait for it, because I know you will do a good job :) also I bought mine a couple of weeks ago and got the whisk that says 80 on it, do you think they will replace the whisk if I ring up and ask? I’m not sure at all if they’ll replace the whisk. I never use the new whisk (110 that I got) because I do not do Italian meringue. I don’t know if they’d work in Hong Kong. It’s probably a good question to ask Magimix. I guess that with an adaptor it should be ok. I do not own a Kitchen Aid so I can’t really compare the pastry actions on both. Also I don’t do butter cream, which seems to be the thing KA does best. So I can’t really help on that one. I make a lot of cake preparations and egg whites on the Magimix and it works super well for me. I have a Kenwood and since the dough blade on the Cook Expert, I’m not using it at all. As I make bread nearly every day when I’m in Sydney (I’ve been travelling for 3 months now and I miss it!) this blade changed my life and the rest of the machine did too, when it comes to bread making. When I started making my sour-dough bread, I used the Kenwood Chef and its dough hook to knead my dough. Unfortunately, following Eric Kayser’s recipes at full speed, the machine fell off the bench twice. I’m glad it didn’t kill one of my kids or Sacha the cat… It lost its feet after a while and couldn’t stay in its corner of the bench when working… it had to move forward and threaten to fall every time. It was a nightmare to have to hold on to the machine while it was shaking and vibrating for 5 + 7 minutes!! With the Cook Expert, not only it doesn’t move but I can leave the dough to proof at 37°C or more for a while which makes bread making in Winter a dream! It keeps the dough raising in its double walled bowl. I love it. Making bread has never been easier and faster for me. Both the companies give incredible features. makes it very hard to decide between the too. I was just wondering whether a steel jar is a good idea since you cannot see the volume of the food inside when the lid is closed. 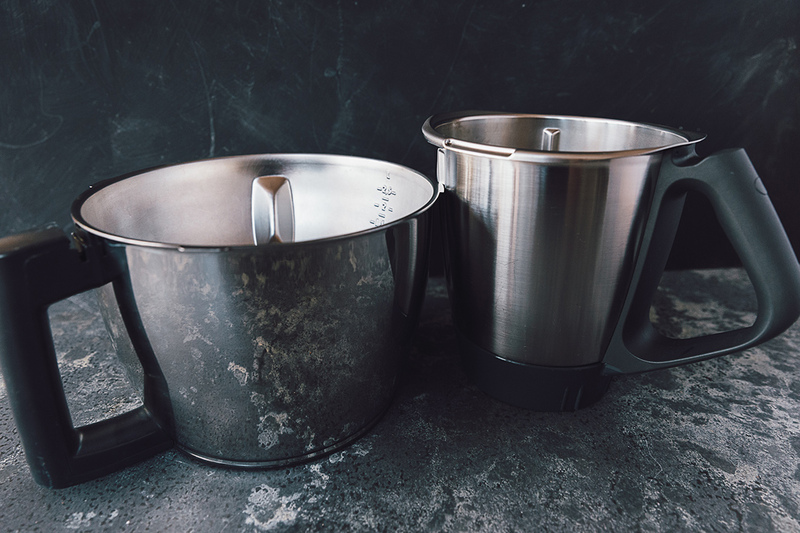 They both have steel jars: Thermie with a single wall which makes it super boiling hot and dangerous for kids, MCE double wall which is much safer (external walls are only a bit warm) and keeps your soup ultra hot for hours. Thermie has an opaque lid with a tiny hole to take a peak when you stop the machine (if on high speed). MCE has a glass lid so you can see what’s going on inside at all times. This review is very comprehensive and worth reading for serious buyers. I recently consider to take a leap of faith to get one of them from outside the US. From the perspective of partying and mass production, Magimix wins almost totally. However, there are some functions I hope Magimix to perform at least OK compared with Thermomix. 1. soybean milk without filtering: in view of merely 6000rpm, is it possible for Magimix to grind and taste alright without filtering? 2. lemon juice without juice extractor: just diced lemon/lime with rind, sugar and water, how does it taste? 3. coffee bean grinding: how about the expresso? BTW, I found that the new Kenwood kCook Multi Smart model also very appealing for a smaller size and versatile. I cannot really reply or help you here because I haven’t tried any of these usages. What I can tell you is that I highly doubt you can grind coffee in any of the bowls(food processor and metal bowl). It’s not a strong enough grinding tool for wheat or other seeds or rice. You’d need to keep you little coffee grinder, which we have. That being said, I use my Magimix for millions of other things and I truly use it every single day. Thanks for this review! I’m in the market for a food processor and I was thinking of getting a magimix when I came across your post. I own a thermomix and I’m tossing up getting just magimix food processor or the cook expert. I know they are at least 1k different in price but I was thinking if a food processor is going to take up space I might as well a thermal cooker. Is it easy to use thermomix recipes in the cook expert? I don’t want to end up just using the food processor component! What are your thoughts? The recipes in the book and online, with the Magimix community, are really easy to follow. You can also use them as a base to create your own, which I do a lot.